This Triple Capacity Receptacle is great for high volume areas. 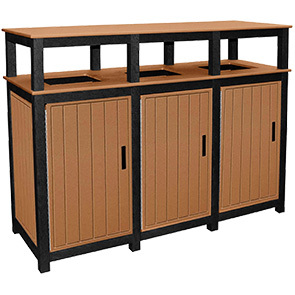 The unique receptacle combines three, 32 gallon bins together in a solid row. A solidly constructed unit made from 100% recycled plastic, it will provide years of service and is virtually maintenance free. Each of the three containers have ergonomic side opening doors, providing easy access to change the included liners. Your bin will promote responsible waste disposal, it's a triple threat to litter. The panel and frame are available in popular color options to fit into a new or existing design scheme.